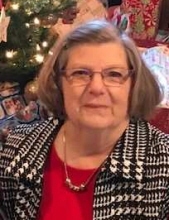 Connie Sue (Siron) Bork (73) passed away quietly at her home in Lexington, IL on Saturday, February 2, 2019. Connie, a life-time resident of Lexington was a loving wife, daughter, mother, grandmother and friend. Her family and her faith were the strongholds of her life. She bled Lexington purple as she could often be found supporting her local teams, and especially her two grandsons. Connie has been active in the community serving as Lexington Township Clerk for many years. She was presently on the Lexington Community Center board, LHS Alumni Reunion Committee, Lexington Ladies Club, and an active member of the United Methodist Church. She was a 1963 graduate of Lexington High School. She worked at Country Companies and Lexington Bank before retiring from Account Benefits at State Farm in Bloomington. Daughter of Harold and Verneil Siron, Mrs. Bork was born October 5, 1945 in Bloomington, IL. She married James Edwin Bork on May 6, 1972 in Lexington, IL. He preceded her in death in 1995. Survivors include her two sons, Scott Bork of Lexington, Geoffrey (Kimberly) Bork of Dixon, two grandsons, Zachary (14) and Aiden (7), and her father-in-law Edwin Bork of Bloomington. She was also preceded in death by both parents and her mother-in-law Margaret Bork. Visitation will be at Calvert –Johnson & Musselman Memorial Home in Lexington from 4-7pm on Wednesday, February 6th. Funeral services will be officiated by Pastor Garry Gromley at First United Methodist Church in Lexington on Thursday, February 7th at 11:00 am with visitation one hour prior at the church. Burial will be immediately following at Lexington Cemetery. In lieu of flowers, memorials may be made to First United Methodist Church, the Lexington Community Center, or the Lexington Food Pantry. "Email Address" would like to share the life celebration of Connie Sue Bork. Click on the "link" to go to share a favorite memory or leave a condolence message for the family.